Like so many ubiquitous edibles, which survive the shifting vagaries of popular culture — pizza, hamburgers, even Caesar salad — many nationalities stake claim to their origin and preparation. The lore, hype and speculation surrounding the omelet are no exception. I have no towns to conquer or villages to feed, just myself and a hungry husband. Besides, huge omelets, like Napoleonic armies, are often tough, a less etherial bite than an omelet made with a deft hand and two eggs. The techniques behind constructing an omelet can be as simple or complex as the person wielding the saute pan. One could simply whisk together some eggs, pour them into a greased skillet, add fillings or not, fold and “Voila”. That very omelet could legitimately call itself an omelet even if didn’t contain so much as a sprig of dill. But it’s such fun pulling back the folds of an airy omelet, like delicate wrapping paper, and discovering a gift of seasonal, savory goodies. It was a treat using Michigan eggs, goat cheese, asparagus, chives and morels in the following recipe. 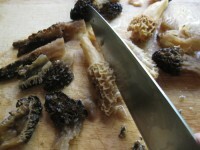 We were lucky to find the morels in last week’s hunt, but any mushroom would be a fine substitute. There is much debate regarding ways to achieve that classic omelet of perfection. Should water, cream or nothing be added to the eggs; should the eggs be lightly beaten with a fork or whisked until frothy; should the heat be high, low or turned off; should the omelet be folded or rolled. And who would guess that the cook’s fortitude would figure its way into omelet preparation. “You must have the courage to be rough or the eggs will not loosen themselves from the bottom of the pan.” writes Julia Child in Mastering the Art of French Cooking. After reading Julia Child’s13 page, well-illustrated treatise on making an omelet, the only certainty about undertaking a classic French omelet preparation is it’s not a recipe for the cowardly. My omelet was patched in a buttery golden brown goodness; I prefer more cooked, less creamy eggs. My omelet was also rolled a bit thin, not the “smooth, gently swelling, golden oval” Julia prefers. But it was tender, thin and light; to my palate, a masterful eating experience. The instructions in the following recipe were adapted from The Best of Fine Cooking’s CookFresh 2011 magazine. Melt 1/2 tablespoon of butter in an 8-inch nonstick skillet over medium heat. Sauté mushrooms in butter 1-2 minutes or until just limp. Meanwhile, in a small bowl, lightly beat the eggs, 1/8 teaspoon kosher salt, and a couple of grinds of fresh pepper until the eggs are frothy. Spoon the goat cheese down the center third of the omelet and spread in a thick, 1-inch line. Place asparagus on top of the line, then sprinkle with reserved morels and chives. Let sit for a minute. 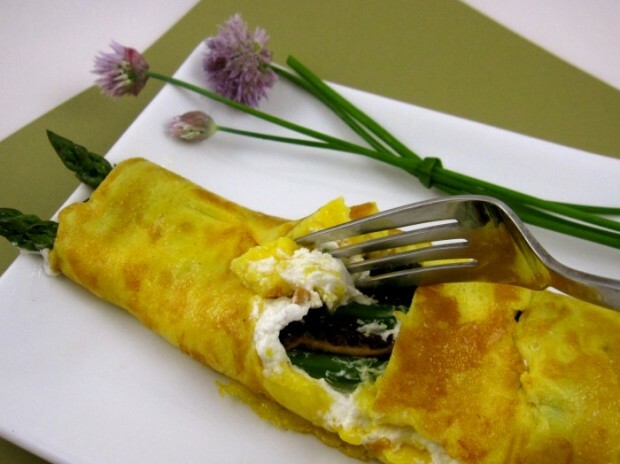 Fold a third of the omelet over the asparagus-cheese mixture. Shake the unfolded third of the omelet up the side and slightly out of the pan. Invert the pan onto a plate to complete the final fold of the omelet. It should be folded in three, like a letter. Serve immediately. *Blanch asparagus by cooking in salted, boiling water 30 seconds to 2 minutes, depending on the thickness and freshness of the stalks. More Recipes Filed Under "Egg dishes"